ETP FIX Order Book Manager (OBM) is a comprehensive toolbox to test order entry, executions, ATDL files and FIX market data. When you need to do ad-hoc testing of your order management system's API, your standard trading front-end might not provide enough information on what is really going on the wire. 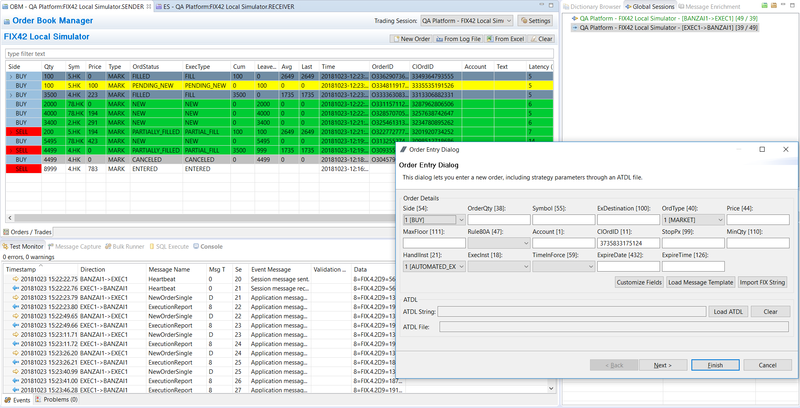 Esprow ETP FIX Order Book Manager is the easiest way to test entry of orders, amendments and cancellations into any FIX-based OMS while monitoring and designing the flow of FIX messages. With a familiar interface that looks and functions like a standard order entry ticket, it is a complete toolbox to dig deeper into the flow of FIX messages between you and your OMS. Gain a deeper understanding of how your order management applications responds to each FIX message, custom FIX tags, strategy parameters or undefined FIX tags. 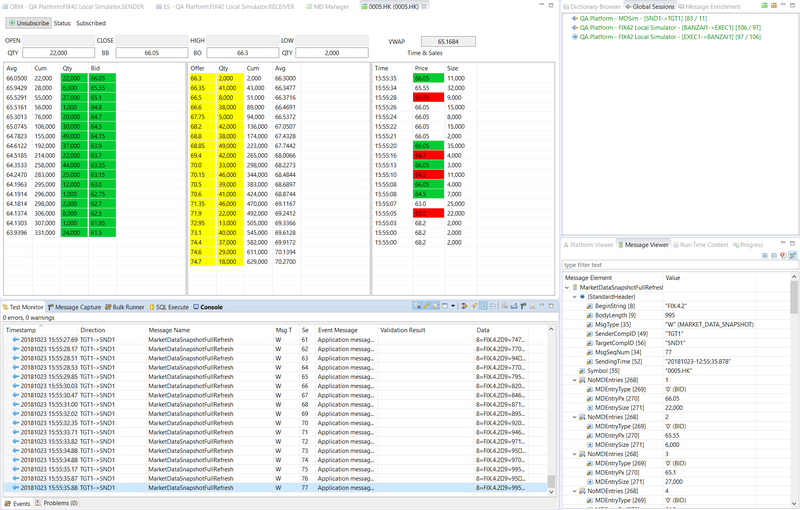 It includes support for subscribing to and analyzing FIX market data for complete testing of your OMS messaging layer. FIX order entry, amendment, cancellation. Inspect FIX messages before they are sent. Modify FIX messages on-the-fly before they are sent. Add undefined FIX tags on-the-fly to outgoing messages. Load ATDL .xml files and render strategy parameters UI in real-time. Load FIX messages from raw FIX strings. Subscribe to and analyze FIX market data. Easily hit real-time market data. For more information on ETP FIX Order Book Manager please contact Esprow Sales. All the power of your own FIX exchange running on your PC. Carry our interactive testing sessions with your clients; receive their orders, accept them or reject them; respond with malformed responses or unknown FIX tags for truly low-level API testing.